. Published on 2014 . I take the position that the issue of gender parity is already obsolete. It’s not that gender equality isn’t important. It is essential. We should be one hundred percent vigilant, as we ought to be with any other form of discrimination. As such, the Copé-Zimmermann law on the number of women that sit on boards of directors has brought concrete changes to major companies, especially those that hail from the paternalistic industrial tradition. Yet it seems to me that young companies like ours grew up in a different world where there’s so much competition, a world where the younger generation is revolutionizing our way of life and our conceptions. In our world, women are truly equal to men. And we’ve got the figures to prove it: at GROUPE ONEPOINT, women make up 50% of the management team. 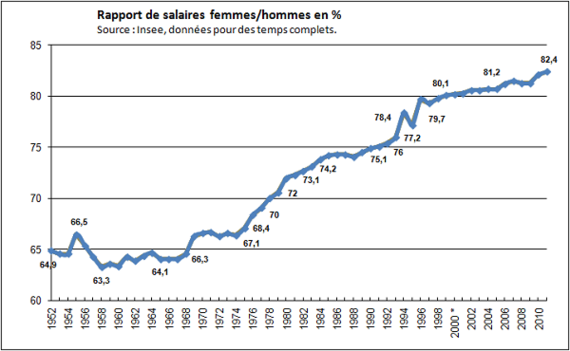 There’s no gender pay gap; in fact, women’s salaries are slightly higher than men’s (1%). Gender equality has become so apparent that we don’t need a special law or warning. We’ve moved on to worrying about other things, like performance, individual autonomy and development, continuous progress and learning for everyone. In the already dated words of Françoise Giroud: “Women will be truly equal to men the day an incompetent woman is given a high-level job.” This sentiment resonates with the ever-present feeling of a real and profound injustice that we can’t ignore, especially because it still persists 30 years later. In an equal position and with equal expertise, women make 8% less than men. They represent only 10% of the management teams at major companies. And they hold the majority of part-time positions—but not by choice. Indeed, the debate about the dominant role of men is largely a reflection of large companies, many of which have been around for ages—essentially the industrial corporations of the 19th and 20th centuries. They follow a definite patriarchal model and historically have a rate of education and employment that’s lower for women than men. Due to a kind of cultural inertia, even today, the role of women is subconsciously influenced by the mental and social structures of last century. The fact that it’s difficult for these large groups to change is placing serious legal constraints on our economic fabric, even though a new generation of companies (since the mid-nineties) has been born with a fundamentally different DNA. There’s no longer an imbalance or even a distinction between men and women. These companies were born without even the notion of gender discrimination. There are several reasons for this new style. First, the new generation is changing our perceptions: households now have two incomes; fathers are increasingly involved with their kids and families. There’s no reason to favor one over the other. Above all, young people no longer believe in these previously male-dominated, highly hierarchical structures. Their concept of work is more flexible, more independent and networked. Lastly, today’s service companies are operating in an ultra-competitive environment, with markets undergoing major changes every six months. Their models are constantly evolving and have little in common with the large industrial corporations of past centuries. These companies have a shortage of employees and are always looking for new talent to meet their current stage of development. Adding another criterion, such as the preference for a man or a woman, means imposing an additional and useless constraint that threatens their survival. These companies are interested in the nature of their employees, so that all individuals can achieve their full potential and freely develop their own personal and particular form of potential and genius. At these companies, gender equality isn’t viewed as a legal requirement, It’s first and foremost an opportunity to attempt to strike a balance. This balance, a component of which is the question of diversity, benefits the company. The law of equilibrium and the law of flux are laws of functioning that the universe applies to itself. Obvious imbalances necessarily give rise to upheaval, which leads to subsequent imbalances. And when we artificially block these fluctuations, the system stops working and breaks down. Discrimination against women is one kind of blockage, as are pro-active corrective measures that slow down the dynamic that’s already in place. They reinforce barriers and bolster mutual prejudices. If we’re already returning to an equilibrium between men and women, and we’re no longer at the corrective stage, the company remains the guarantor of equality among individuals. If new companies are less familiar with the disparities between men and women, they should at least be as vigilant as the major corporations and ensure that women are never discriminated against again. Implementing this vigilance could be easier, though. Ensuring that being a woman is in no way viewed as an obstacle to getting a promotion, supporting the beginning and end of maternity leave…But it’s just one form of vigilance among many: racism, the prevention of physical and psychological violence, religious practices, etc. Fundamentally, ensuring equality in the workplace isn’t just about maintaining a set number of jobs distributed evenly among men and women, different generations and people from different backgrounds. Equality in the workplace means ensuring the freedom to learn, to be ambitious and to achieve one’s full potential. As it stands, the issue of women, as such, is already obsolete.